I was excited for the opportunity to review “U.S. Veterans in the Workforce” by Mike Schindler. My interest in working with military veterans stemmed from having four generations of veterans in my family. One of my grandfathers served over forty years of active duty in the Navy. The other one was a retired Colonel in the Army. My father is a Naval Academy graduate. The list of family members goes on. My dedication to helping active duty military and veterans led me to be part of a team that brought a Military and Veteran Resource Center to my community college campus. “U.S. Veterans in the Workforce” is a resource that is critical for military veterans and people who work with them. The author uses real life scenarios of military families to illustrate how difficult it can be for a dedicated veteran to transition over to the civilian world. He discusses the veterans needing assistance with seeking employment so that they know how to market themselves in a way that will appeal to the corporate world. Many veterans only have their military experience to rely upon when trying to seek employment in the civilian world. A lot of them do not know how to translate their special skills into civilian terminology so that the people hiring can understand the value of these applicants. Also, as the author points out, not all veterans are wounded warriors, which has started to become a stereotype for veterans who have served during wartime. The veteran needs to be educated on how to job seek in a way that will emphasize skills and traits they might consider to be standard for all employees, but are not. This includes, having a strong work ethic, being on time, being a team player, having the dedication to make sure that the job gets done. Some work skills they received in the military might not be of use for the job in which they are applying, but these other skills will be of value in any place of employment. “U.S. Veterans in the Workforce” discusses why it is critical for active military to have the right support systems in place to help ensure a smooth transition to veteran status. This not only involves assisting with accessing their benefits for education and employment, but also housing, medical care, and psychological issues. This would help prevent them from cycling through issues with poverty, suicidal thoughts, addiction, unemployment, and divorce. With 7% of our population being veterans, it is really important that they get the services they need to be able to transition quickly and easily. The information contained in “U.S. 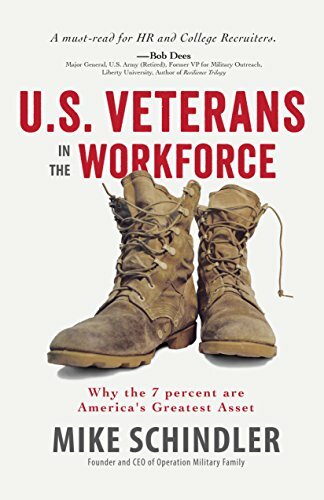 Veterans in the Workforce” by Mike Schindler is incredibly valuable. It helped me to open my eyes as to why my father, a Naval engineer and Naval Academy graduate was a Mc Donald’s manager after his service. It wasn’t just economic issues that had my brother-in-law, a Lieutenant Search and Rescue pilot in the Navy, moving furniture when he retired from service until he could find the right job. My desire to educate myself to help others has given me a greater understanding of what was actually happening in my own life because of reading this book. This is highly recommended reading!